What is the current state of the rug market? It is strong as ever. In fact, U.S. machine-made rugs can stake claim to about 16 percent of all domestic soft floor coverings. Companies like Shaw, Mohawk and Springs dominate sales. About 25 percent of the market comprises hand-made imported Oriental rugs. Total retail sales of area rugs in 2003 (the last year numbers are available) was $4.3 billion. This growth trend continued in 2004. The continuing gains in rug sales can be attributed to steady hard-surface sales activity, which goes hand in hand with area rugs. Today, homes have 50 percent more hard surface than 10 years ago. Homes are also getting bigger. People now have “great rooms” that function as the gathering area or meeting space. This increase in room size has led to sales growth in 11-by-13 rugs. Recognizing this trend, rug manufacturers have stepped up colors, looks and designs while decreasing the price points for entry-level rugs. This has definitely resulted in unit growth – which translates into more rugs to clean. Design trends have seen more sales of contemporary and transitional designs, a move away from the traditional “Oriental rug look.” Happily for the rug cleaner, earth tones and light colors, which tend to show soil much quicker, are still popular. Tibetan rugs lead the way in contemporary design and color. Believe it or not, the ‘60s look is back, with dynamic colors and designs. 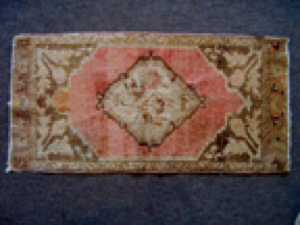 Tibetan rugs also incorporate silk designs surrounded by wool pile. Cleaning professionals should be careful when cleaning these rugs to avoid texture distortion. Indo tufted rugs are quite popular because they cost less than their hand-knotted counterparts, but from the surface have the same look(Image I). You’ll need to look at the back to be sure of what you have. 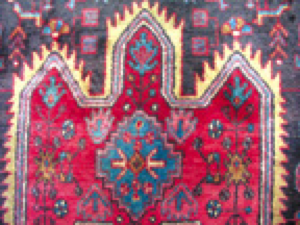 Super chemically washed older Oushak rugs from Turkey are commanding big prices (Image II). These same designs are now being copied from Egypt to China. They are notable for their simple geometric patterns and neutral colors – salmon, cream, cinnamon and celadon green. What matters most now is color and design, not country of origin. You will start to see more deep red, burgundy and browns in contemporary rugs (another reason to always do your colorfastness test as part of the pre-cleaning inspection). You will also see different shapes – rounds, ovals, and octagons – as the consumer is offered more options for customizing the look of her home. It has been three full years since the embargo on rugs from Iran was lifted. During the 13-year drought of Persian rugs (only coming into the U.S. illegally), India, Pakistan, Turkey, China and Egypt increased their production of hand-made rugs, which are now often considered better than Iran’s. This is a huge change in the hand-knotted rug market. In the past, Iran was the benchmark by which all other countries were judged in terms of design, color, quality and execution. Iran is still making some exceptionally beautiful rugs, like those imported by Miri Iranian Rugs of San Francisco. However, since the late 1970s Iranian products have suffered from a lack of good craftsmen, due to the influx of oil money into the economy and the 1979 Revolution that disrupted the country on all levels. Prices, along with quality, have reversed position as well. 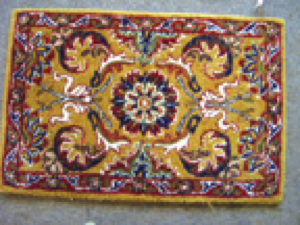 A good example is a classic Persian Heriz design, made by Afghan refugees in Peshawar, Pakistan, that sells for $12,000. The same rug made today in Iran would be priced at about $2,000 or less. This is due to inferior dyes, careless washing and finishing, and the lack of imagination in design execution. As cleaners, we will start to see a lot of these inexpensive rugs from Iran. In the past, cleaning a Hamadan (Image III) or Tabriz (Image IV) was mostly trouble-free. Now, it is imperative to do a colorfastness test. Also, be careful of full-immersion cleaning. Soaking these new-production Persian rugs can ruin your day, not to mention the rug. This is why it is so important to know your rugs. I can warn you about the problems of newer production from Tabriz, but if you are not familiar with Persian rugs in general, and Tabriz in particular, this hint is of no value. To begin the process of rug identification and gain a basic overview of rug cleaning, consider attending the new Institute of Inspection, Cleaning and Restoration Certification Rug Cleaning Technician course. This new certification is the latest addition to the long list of educational opportunities from the IICRC. Contact your local distributor to see if they have scheduled this class or go to their Web site at www.iicrc.org. The future for rug cleaning is bright, as more and more homeowners purchase these textiles. But it’s important to get the basic knowledge before you start cleaning.